When Ed and I were looking at houses during our first year of marriage, we were looking for a lifetime house. Not our dream house…we knew we wouldn’t be able to find a house of our dreams. We were looking for a house where we could raise our kids; a house in a nice neighborhood, close to a playground, with plenty of room for a family. One of the reasons we bought our house is because of the beautiful backyard. it was summer weather in May! Our backyard still needs a lot of work; it doesn’t have fancy landscaping and the grass is patchy in areas, but we love it anyway. It’s a great place to have a backyard party, to sit out on the patio with a beer, or to sit around the fire pit on a chilly night. Blowing bubbles at Emmy’s last birthday party. 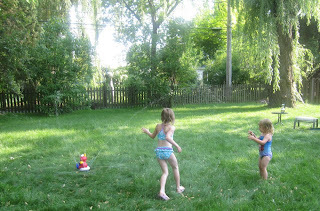 Our backyard is just a typical backyard in the middle of the suburbs, and sometime I feel like we don’t take full advantage of playing outside. 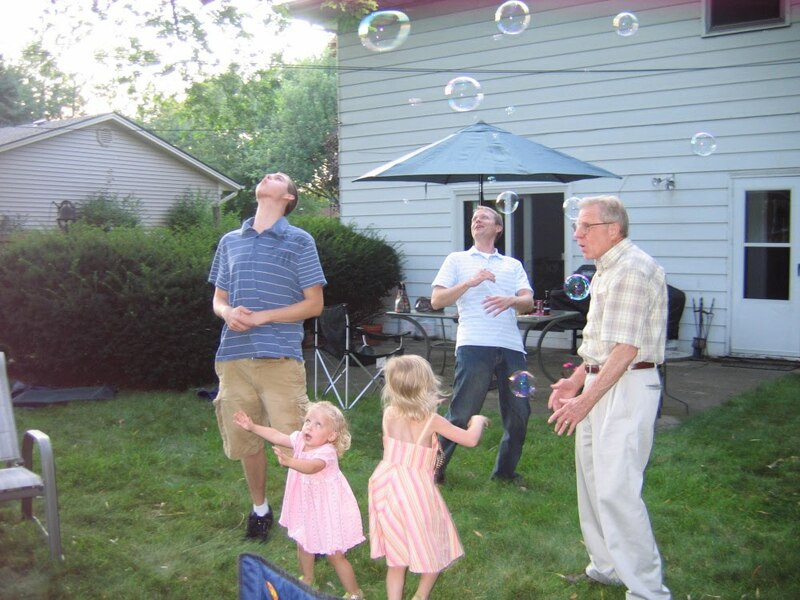 This summer, I want to spend as much time in our beautiful backyard as we can. Sometimes we forgot how lucky we are to have this great place to visit, right outside our own back door. 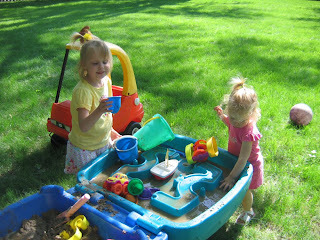 Lily and Emmy playing in their new sand and water table last summer. Share your backyard with us! What’s right outside your back door? Or link up any place you’d like…where in the world have you been? I love backyard parties! Your yard is perfect for them! You wouldn't want to have fancy landscaping if you did a lot of entertaining. It would be pretty but the kids would wreak havoc on it! Your yard looks very nice and big! We have a small yard, but then we don't have children so a big yard isn't necessary. If we did have children, I would have looked for a house with a big yard like you did. What a lovely backyard! 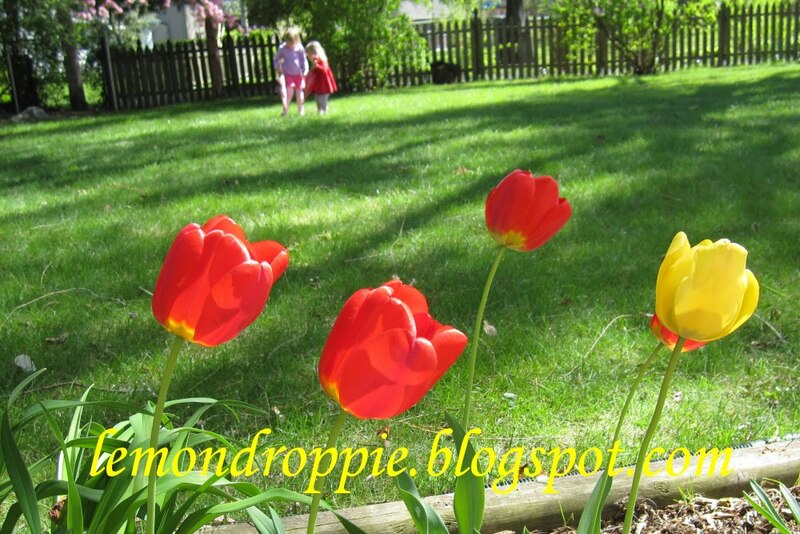 I love your tulips. 🙂 My father used to plant them near our garage when I was a child. You know, every house we've owned has a wonderful backyard as well, and like you, we've never spent as much time out there as we should. I'm glad you're changing at your place this year! What a sweet post and so true! Your yard is lovely and a great place to raise your girls. It looks like a perfect family back yard! I don't think we have used our yard as much as we could either but it sees more and more use as the kids get older!